Earth’s natural resources are running low. According to the United Nations, if we continue at the current pace, our demand for water will be 40% higher than the supply by 2030. Against this background, scientists and engineers have proposed living on other worlds such as the Moon, Mars or even Venus. We present five types of housing that could become a reality. Because of its proximity—some 380,000 kilometres from Earth—the Moon is the preferred site to host a human colony. The problem is that it has no atmosphere, and thus its inhabitants could see themselves surprised by meteor showers and an average temperature of –23ºC. Housing covered with regolith, the layer of material from the lunar surface, will attempt to alleviate this problem. This is the idea proposed by Foster+Partners for the lunar colony that the European Space Agency wants to establish on our satellite. 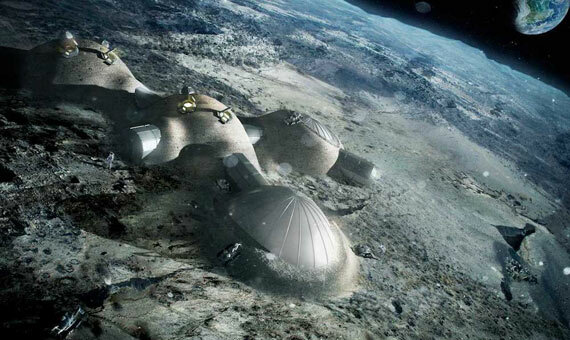 A lunar colony with houses covered with regolith. Credit: Foster+Partners. A tubular module aboard a rocket would deploy an inflatable dome, which would serve as a structure for a four-person dwelling. This design proposes taking advantage of the capacities of 3D printers—which can work with the material of the ground itself—so that the regolith can be gathered and then printed onto the dome of the structure, creating a protective cover. The house would have two floors and would have a watertight compartment at the entrance and one technical support module. Three orifices would let sunlight in and the whole enclosure would be pressurized. The location chosen is the lunar South Pole, which enjoys almost constant sunlight. 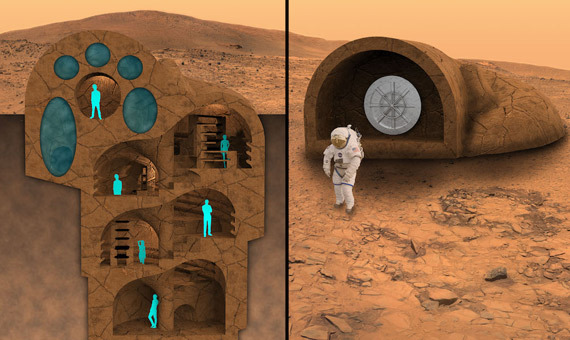 Inspired by the spiral of the nautilus shell, this project seeks to design underground houses on Mars with floors connected by spiral staircases. “Mars has an extremely weak magnetic field that, unlike Earth, does not protect the planet’s surface from the radiation of the Sun,” explains Keegan Kirkpatrick, Project Leader and President of RedWorks, to OpenMind. The objective is to take advantage of lava tubes, wells and craters located under the Martian soil to build houses, which would use regolith and 3D printing to cover the thin surface of the structures. Divided into four levels, the first two would be dedicated to the maintenance of the housing and to bedrooms, kitchen and rest area. The latter two would be used for laboratories, waste and life support systems. 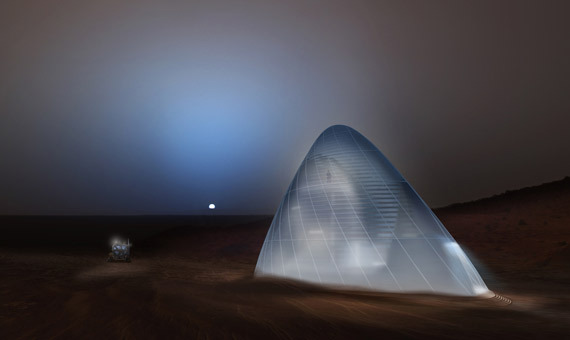 The Mars Ice House project, dwellings built with ice extracted from Mars, won the 3D Printed Habitat Challenge hosted by NASA. Their structure is based on an internal inflatable tube covered with an ice crust five centimetres thick. This layer would serve as an element of protection against galactic cosmic rays. The main advantage of its design is that on Mars, near the surface, there is abundant ice. For the houses to be as bright as possible, all materials would be translucent. Inside the dwellings space suits would not be necessary and vertical gardens are even foreseen. To modulate the temperature, a layer of carbon dioxide would isolate the inside of the house from the icy crust. The planned site is the Alba Mons area, with sun exposure and ice only a foot below the Martian regolith. 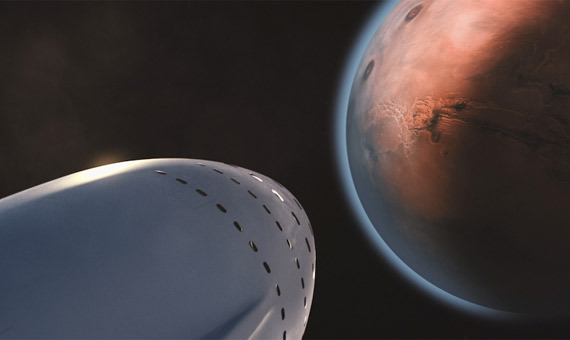 The billionaire Elon Musk estimates that human beings could be treading on Martian soil by 2022. Today his designs are centred on the transport that will take us there, a large ship with the capacity to move between one hundred and two hundred people. With regard to the community in which we will be living, he has only given a few brushstrokes, emphasizing that it has to be self-sustaining and that it will have the capacity to house a million people. His idea is that the colony be established both on the surface and underground. The houses would be installed on the Martian soil, made of glass panels with frames of carbon fibre to construct geodesic domes on the surface. Underground, a team of droids would construct pressurized tunnels in which the experiments and industrial activities of the planet would be carried out. Any idea of ​​building a human colony on the surface of Venus is suicide. To give just a single fact, the average temperature is 464ºC on its surface. 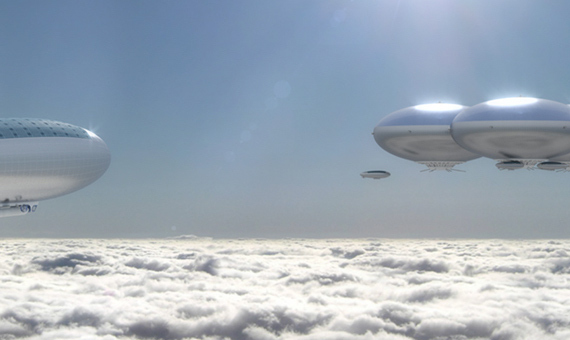 However, several scientists have proposed living among its clouds in hot air balloons. The HAVOC project of NASA contemplates locating a community of these evocative vehicles at fifty kilometres above the surface of the planet, where the conditions are friendlier, with temperatures of 75ºC. The project contemplates several phases and one of them is with humans. The zeppelin would have 1,044 square metres of solar panels and an energy storage capacity of up to 66 hours, to work while there was no sunlight. Beneath the balloon would be located the atmospheric habitat in which the crew would be found.